I have a bit of trouble understanding the recent resurgence in popularity of the subtextless, mean-spirited slasher films we had all previously evolved past by 1985 or so, but nonetheless, they seem to keep coming. By nature, these kinds of films are going to be review-proof. They are not going to be wide-release hits, but they will find a strong, supportive fan base. Mostly, this species hangs out in ultra-low-budget zone, guaranteeing that even that small base is enough to make a financial windfall. Coupling the subtextless slasher with the current fad of life-threateningly scary haunts is a bit more expensive and a bit more of a gamble. 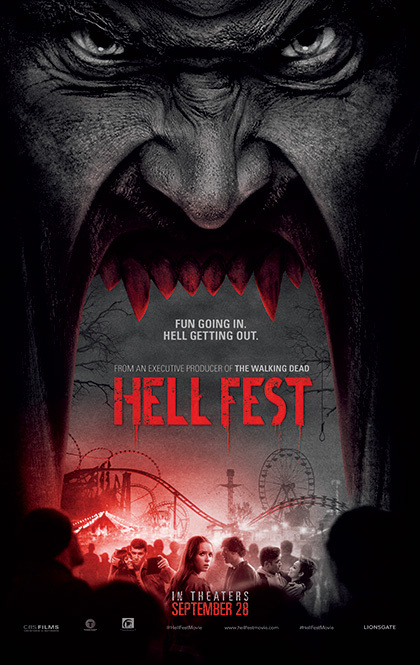 Hell Fest is essentially ninety minutes of watching paper-thinly characterized coming-of-agers wander through a world of unrelenting flashing lights and movie-trailer stabs while being followed by one of the most generic masked killers in the history of horror cinema, known as "The Other." The name is packed with existential wonder, but it would be extremely generous to read anything into it. I would also be remiss if I did not note that despite “The Other”’s lack of villainous substance, the ending makes me think we might have to endure a cinematic continuation of this guy’s story. In record-breaking form, even if we had counted on every finger in the packed house, we would have lost track of the number of jump scares presented. Without sounding glib, it’s probably unfair to judge the movie on plot, character, or most other traditional movie cogs, as I don’t think there was any honest intent to work with those elements, which is, at least in principle, fine with me if the movie is thematically driven or even fun, but this is not really either. All of the budget was likely spent on building or acquiring access to the sets. And the sets were very nice, even sometimes effectively creepy. Once in a while, they made me think it would be fun to go through the depicted haunted house, but as my partner noted after watching the film, “watching kids go through a haunted house is as much fun as watching people play golf.” And sadly, most of the movie is just that - watching someone else have an experience that amounted to a loosely strung together series of moments and set pieces. The writing really just stalls throughout and the setups are candy corny as a bag of Brach’s. Natalie even spends some out-of-place and out-of-character time figuring out where the laser triggers are for the scare activations and which doors actors will pop from to later Chekhov's Gun her way into being able to mostly outsmart the killer at the end, until she eventually fails to outsmart the killer, but he doesn’t kill her yet anyway, allowing her to maybe outsmart him again. I guess he wants to kill everyone else first. Plus, the amazing powers of teleportation and tracking that allow him to turn up at any moment deemed convenient by the writers diminish as the movie hits its watch-checking climax. I can’t say I followed the logic of any of the movie really, but I don’t think anyone involved in production really genuinely cared either way, so it’s all good. It wasn’t really the point. Oh, and just when you wonder if Tony Todd has gotten the featured credit for just doing all the haunt voiceovers, he arrives, extraneously shoehorned in because hey, Tony Todd rules! Before you can say Tony Todd five times into the screen, he’s gone and the writers realize they have two more characters to kill and they are out of set pieces, so they disappointingly throw a couple of quick stabbings in, marking the end of any good kill SFX with still a third of the movie to sit through. RIP smashed heads with match-cut dings. There’s an ironic metaphor contained within the film itself, as the only truly top-notch moment, which presents itself at the beginning of the third act or so, is a scene where Natalie is stalked in the bathroom. The bare, quiet, constantly lit space is actually made scary with great camera work and editing, and it serves as a break from the constant, numbing cacophony and frenetic annoyance of the rest of the film. The moment is also tagged by a conversation with a security guard in which Natalie and Brooke (Reign Edwards, also doing her best to make something of this mess) are gaslighted and dismissed, marking the only perspective or commentary on display. All my complaints aside, this movie will find an audience of young people who will love it. I suspect the biggest demographic will be early teens who have never seen a slasher film, have never been to a haunted house, and can sit through an entire movie structured like an unrelenting movie trailer. They’ll probably turn up for the inevitable sequel, too.